Payload Monitoring Systems were recently fitted to two Hino tip trucks for Logan City Council in Queensland. 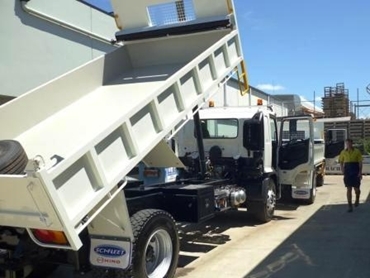 Supplied by Accuweigh’s QWM branch in Brisbane, the Payload Monitoring Systems were required to prevent instances of accidental vehicle overloading. Accuweigh’s Payload Monitoring Systems closely monitor payload weights and are configured to operate warning alarms when nearing the vehicle’s RGVM. Front axle weights are not usually monitored for weight in many tip truck installations as the majority of the load is imposed onto the rear axles only. The Payload Monitoring System comprises two hinge pin load cells fitted to the rear of the trailer with another two load cells mounted under the base of the hydraulic ram. To weigh the contents of the truck, the driver needs to only slightly raise the tipper body for the weight to be transferred directly to the load cells. After the load cells had been fitted by the body works, Accuweigh’s experienced installation technicians performed all wiring and terminations then installed the digital weight indicators into the truck dash boards. Accuweigh has extensive industry experience with all forms of Payload Monitoring Systems for vehicles of all types and capacities. With eight branches across mainland states providing Superior Product Support, Accuweigh are Australia’s Onboard Weighing Experts.